Similar to the SPG 2009 Free Weekend Nights offer (see last year’s post as FYI), SPG is bringing back free weekend nights in 2010. Simply stay three (3) times at a Starwood property between May 1, 2010 to July 31, 2010 and you’ll earn a free weekend night. You must redeem your free SPG weekend nights by December 19, 2010. This year’s redemption process should be very similar to the 2009 SPG free weekend night redemption process. 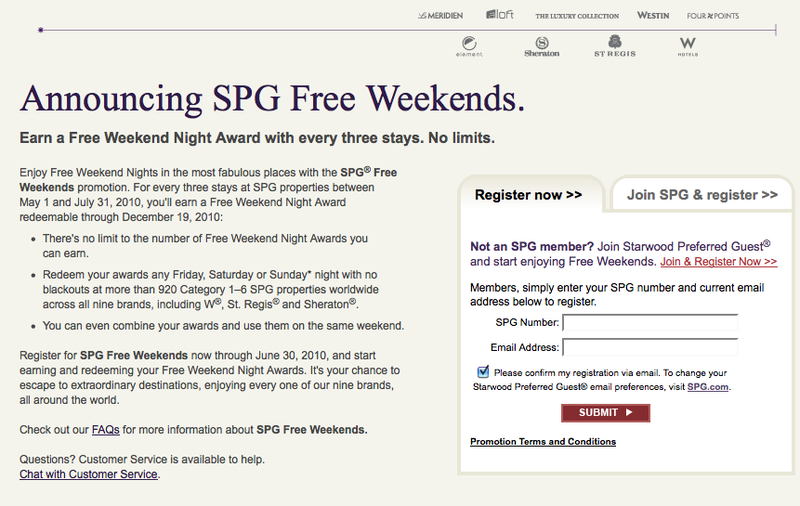 Your 2010 SPG free weekend night should appear on your account 3 to 5 days after your third SPG stay. Keep in mind that “hotels stays” are not the total amount of nights you stay at a hotel. A “hotel stay” is every time you checkin to a hotel. The 2010 SPG Free Weekend Nights offer is a bit less generous compared to the 2009 offer. The SPG 2009 Free Weekend offer only required two stays to get one free night vs. the 2010 offer. The good news is you can earn unlimited free weekend nights if you chose to check-in and check-out every night. Here’s the official link to register and official FAQ page. You must register by June 30, 2010 to qualify.